Cumbria began as a Romano-British Kingdom in the 2C and included Strathcyde in southern Scotland. 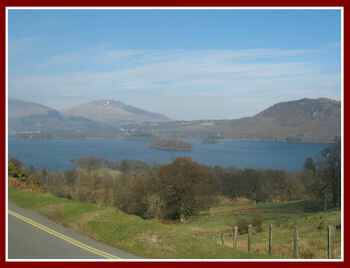 The name Cumbria is derived from the name the Old Welsh speaking inhabitants gave it: ‘Cymru’ or ‘Cumbri’ . Under the Romans, Carlisle became a strategic city on Hadrian’s Wall; it was almost certainly the seat of a bishop. It had a ‘king’ (dux) of the British called Coel, (‘old king Cole’) who carried on after the Romans left. Carlisle was important in developing seats of bishops at Whithorn and Kirkmadrine in Galloway in the 5C. St Ninian may have been a Cumbrian. His work as a bishop and probable founder of the newly discovered (1993) British monastery at Whithorn reflecting the influence of St Martin was of enormous consequence. St Patrick may have lived in the north-west of Britain whence he was taken to Ireland. Ravenglass, Carlisle and Birdoswald on Hadrian’s Wall have all been suggested as his ‘home’ town. 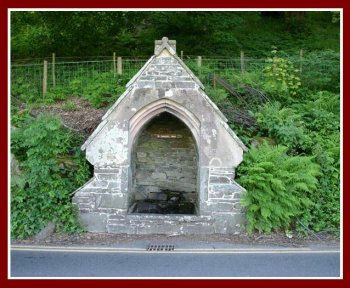 Aspatria and Patterdale and their holy wells may reflect his name but this may be due to Irish settlers in Viking times. The same goes for dedications to St Brigit at Brigham and Bridekirk. On the other hand the dedication of a nunnery to St Brigit at Beckermet may be 7C. 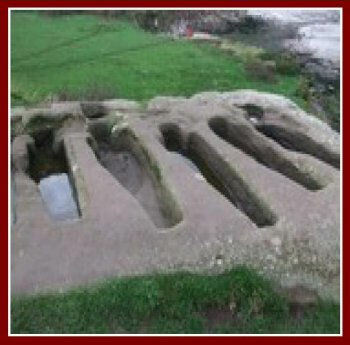 At Heysham in Lancashire are some 6/7C rock-cut tombs close by a tiny chapel dedicated to St Patrick. In 8C a church dedicated to St Peter was built here probably by the Angles, which the Anglo-Saxons rebuilt in 10C. It is thought there was a monastery here somewhere, possibly where St Peter’s now stands. At Heversham, only 15 miles from Heysham, there was an early monastery and settlement. Later Anglian settlers renamed it as Heversham. The 6C British St Kentigern, or St Mungo (‘my dear one’) was an itinerant bishop based on Glasgow in Strathclyde Bishops in those days usually lived in monasteries and undertook itinerant missionary work wherever they went. He founded monasteries at Hoddom and possibly Ecclefechan in Dumfries. He is said to have spent time in Wales and founded monasteries there. His tomb is in the crypt of Glasgow Cathedral. According to a 12C ‘Life’, he is said to have preached at Crosfeld – presumed to be Crosthwaite in Keswick. 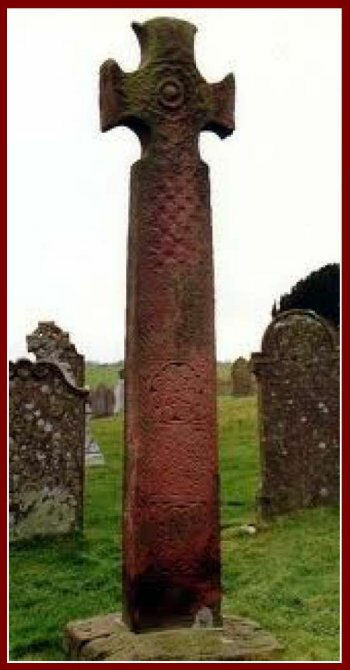 But dedications of churches and holy wells are likely to belong to the early 10C and 11C when Britons from Strathclyde once more controlled the area. Govan was an early 6/7C Christian site in the area of Glasgow, chosen in the 9C was to became one of the major centres of the Kingdom of Strathclyde. The church is dedicated to St Constantine of whom nothing is known. 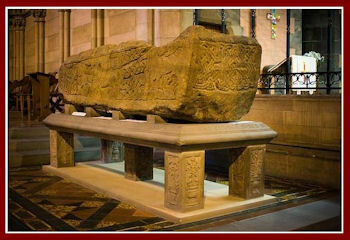 But an elaborate sarcophagus, found in the 19C, may have been made for him in 9C. The church holds many fine crosses, slabs and tombstones. 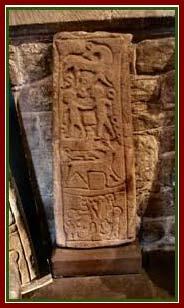 At Wetheral neat Carlisle there are some rock cut cells called St Constantine’s Cells. This may suggest a pre-Norman connection with St Constantine. Or it could refer to a Constantine of whom we have no knowledge. There was a Roman Fort which acted as an outstation of Hadrian’s Wall at Bewcastle up in the hills north east of Carlisle. An outstanding 7C Northumbrian cross suggests this may be the site of an important early church and monastery. Ninekirks, just east of Penrith, was another site occupied since Roman times. With remote access, set in the bends of a river and overlooked by caves, it was the kind of place much favoured by early hermits by association with the features at St Martin’s monastery at Marmoutier. Aerial photography also suggests the site of a small monastery. 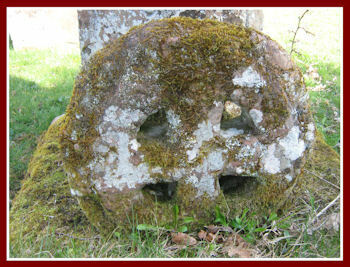 A very similar site is to be seen at St John’s Waberthwaite on the coast. The same features present themselves: remote access, a 7C church built in the bends of the river overlooked by cliffs, additionally the Romans built a ford across the estuary of the Esk hard by the site. This kind of topography suggests an early British foundation. The present church is a small Norman rebuild. 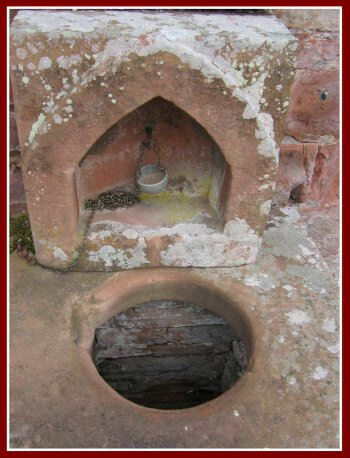 The water of an ancient well-chapel north east of Penrith. flows out from a crop of rock and through the church into a holy well. The Northumbrians conquered Rheged in 7C. They re-dedicated the place to the Northumbrian King St Oswald (Kirkoswald, church of Oswald) who was regarded as a martyr because he died on behalf of his Chistian Kingdom fighting the heathen. The wooded island of St Herbert. 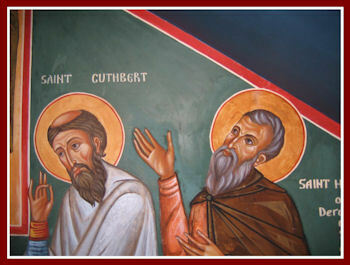 The Northumbrian St Cuthbert was given land in Carlisle by King Ecgfrith of Northumbria for a nunnery. Remember, brother Herebert, that you ask me now concerning whatever undertaking you may have in hand, and that you speak to me about it now, because, after we shall have separated, we shall see each other no more in this life. I am certain that the time of my death approaches, and the time of leaving my earthly tenement is at hand. Upon hearing these words, he threw himself at his feet with tears and lamentations, saying, " I beseech you by the Lord not to leave me, but be mindful of your companion, and pray the Almighty Goodness that, as we have served Him together on earth, we may at the same time pass to heaven to see his light. For I have always sought to live according to the command of your mouth; and what I have left undone through ignorance or frailty, I have equally taken care to correct, according to your pleasure." The bishop yielded to his prayers, and immediately learnt in spirit, that he had obtained that which he had sought from the Lord. Arise, my brother, says he, and do not lament, but rejoice in gladness, for his great mercy has granted us that which we asked of Him. The event confirmed his promise and the truth of the prophecy; for they never met again, but their souls departed from their bodies at one and the same moment of time, and were joined together in a heavenly vision, and translated at the same time by angels to the heavenly kingdom’. 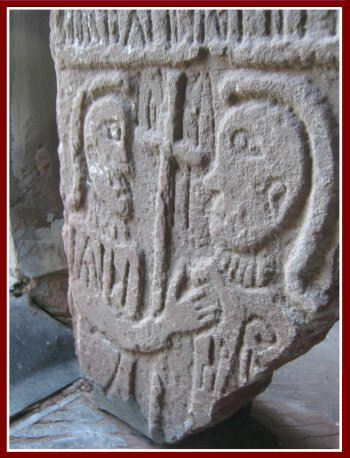 Luigne of Iona and St Theodore of Canterbury? The mouths of the western rivers were cut off by the mountains and protected by the constantly shifting sands of the tidal sea in ancient times. They offered ideal places of retreat and solitude. At Great Urswick on the Furness peninsula, the boundary walls of a large unidentified monastery situated by the sea, have been found. It is pre-viking. 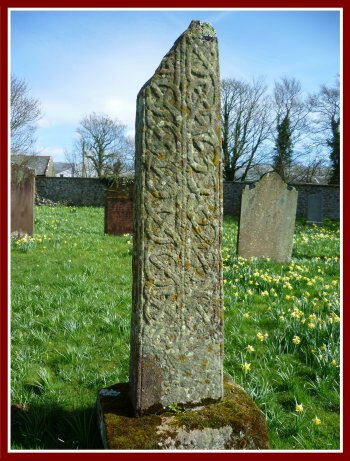 There is a piece of a Northumbrian cross with an inscription in runes cut over earlier writing, with 2 priests in the bottom panel. One interpretation is that the two are Luigne of Iona and St Theodore of Tarsus (680), the Greek Archbishop of Canterbury. St Bede in 731 mentions a monastery at Dacre. 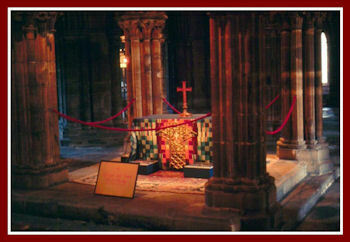 One of the monks there who had a tumour on the eye was healed by the relics of St Cuthbert. The Vikings came there: there are pieces of 2 Viking sculpture. One is a cross with Biblical scenes. The other commemorates the Peace of Dacre when the Saxon Athelstan, King of England, defeated Constantine II, King of Scots, and Owen Caesarius of Cumberland, in 927 at the battle of Eamont Bridge, just south of Penrith in Cumbria. A condition of peace was that Constantine and Owen embraced Christianity. The story of St Bega might reflect this background. As an Irish maiden who was escaping a suitor she crossed the Irish Sea. She is said to have landed at St Bee’s where she lived a solitary life. A date of 950 would seem right. 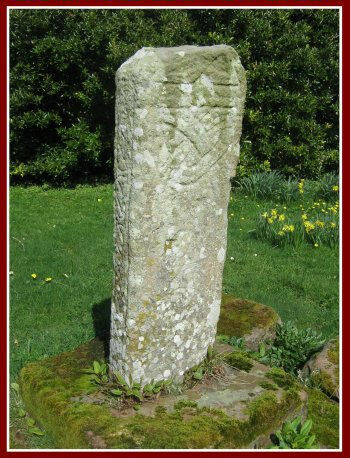 There are 2 Viking cross shafts at St Bees. There was also a holy well. When later, in the 11C the Normans conquered Cumbria, establishing religious houses was part of their system of civil government. A Priory was founded at St Bees in 12C for just a prior and 6 monks – in a huge building symbolic of Norman power. But it had a chapel dedicated to St Bega – an acknowledgment of whatever had preceded the Priory. The threat of Irish/Viking/ pirates seems to have driven St Bega inland. The site of her cell would seem to be on a piece of land between the steep side of Skiddaw and the shore of Lake Bassenthwaite. There is no other reason that the pre-Norman church should be built here. In Ireland it was common practice to build over the site of one regarded as a saint. Recent floods have revealed wharves that show the Romans found the river navigable up to Cockermouth and beyond to Bassenthwaite. This would have enabled St Bega an important access to the sea and therefore to St Bees. 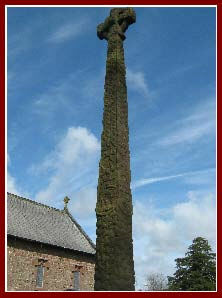 A superb 14’ Viking high cross was erected at Gosforth about 950. Its carvings have Norse as well as Christian symbolism. Christians used the old Norse myths to present the Gospel. There were other crosses here, and other sculptures and tombs can still be seen. At no time was Cumbria ever part of any of the seven Anglo-Saxon kingdoms and became part of ‘England’. At times much of it seems to have belonged to no one, apart from the Britons, or else different pockets of it to different settlers: Irish, Northumbrian, Viking, Norse and Danes. 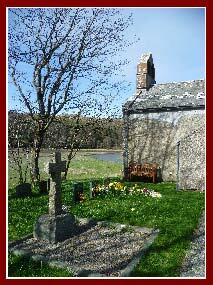 There may have had a monastery on a remote spit of sand on the estuary of the river Esk at Waberthwaite. 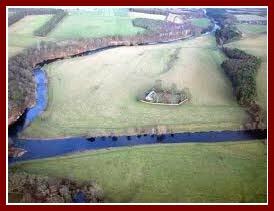 The topography of the site (which even includes a Roman ford across the river, resembles Ninekirks and suggest a very early monastic habitation. The Angles and Norse left crosses and the Normans built the small church. Nearby at Beckermet on a windswept mound near the sea is a church on this site, dedicated to St Bridget , may go back to 7C. 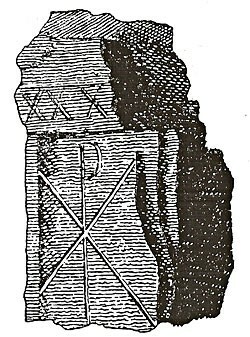 Runic inscriptions on a 10C cross baffle all who attempt to interpret it. At St John’s Church in the village there was another monastic cell. This suggests one for women and one for men. These monasteries survived the inroads of Angles, Vikings, Norse and Scots. There were few churches in the remote countryside. Crosses however may mark the location of monasteries or churches. Irton, snuggling among the western hills, looks out onto the remote Wasdale mountains. 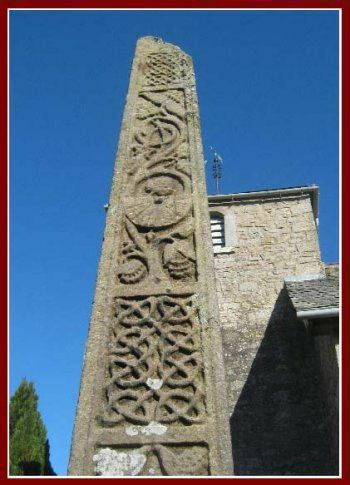 It has a complete 9C 10’ high Anglian cross which now seems to be the middle of nowhere. 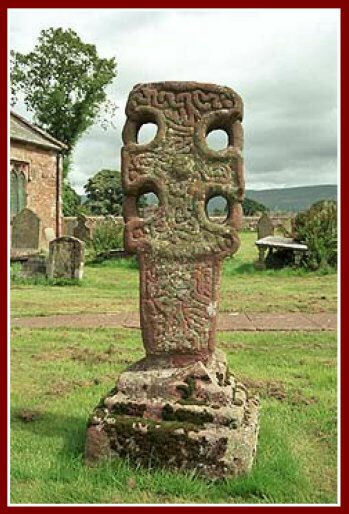 At Addingham in the Eden valley north east of Penrith, is a fine Anglo-Saxon hammerhead cross. The Anglo-Saxon settlement was washed away in 14C when the river changed its course. King Dunmail was possibly the last British King of Reged. He was defeated at Dunmail Rise south of Keswick in 945 by King Edmund of England and King Malcolm of Scotland. The Anglo-saxon King gave the whole territory to the Scot as his ally to keep him ‘on side’. 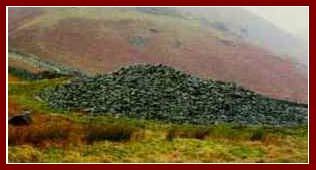 The ‘Rise’ is the pile of stones under which the Cumbrians are said to have buried their King. The mountains of Cumbria, otherwise known as the Lake District, remained sufficiently inhospitable for humans not to bother too much with them in the following centuries, except by hardy monks and more latterly hardy miners. Other areas have many more saints than Cumbria. 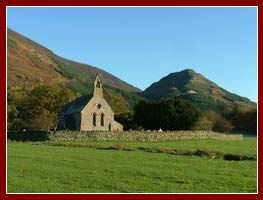 But one small village, Keswick (pop 4500), can claim four – in effect the saints of the whole county. An Orthodox Church dedicated to them began here in 2007.